The distribution industry today bears little resemblance to the distribution industry 10 years ago. Digital transformation is bringing new technologies and efficiencies to distributors. While many distributors are still getting by with the paper manifests and manual processes they’ve had in place for decades, most are replacing outdated practices with modern technologies and new processes to meet increasing customer and vendor demands for real-time information. As a new generation of workers enters the industry, leaders are also working to meet increasing staff demands for technology that’s easy to use, effective, and flexible. For today’s distributors, it’s not enough to know your business. You need to do more, faster, and with greater reliance on technology than ever before. Becoming a digital distributor has become essential to competing and growing, no matter the market. It might seem daunting to take on massive online distributors, but smaller companies have an advantage over huge competitors—agility. You can provide value-added services to differentiate yourself and meet the needs of your customers. To better serve your customers while growing profitably, however, you need reliable technology solutions. 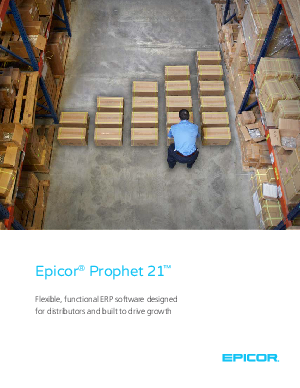 Epicor Prophet 21 software was designed to meet the unique needs of distributors. It offers robust features including eCommerce, mobility tools, customer relationship management (CRM), wireless warehouse management, purchase management, and analytics to make more informed business decisions. With deep industry knowledge and best practices built into features throughout the solution, Prophet 21 can deliver the digital transformation your organization needs to grow—reach more customers, deliver more value, and secure your accounts.